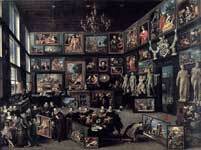 The Gallery of Cornelis van der Geest. Willem van Haecht (1593 – 12 July 1637) was a Flemish Baroque painter best known for his gallery pictures and the son of the landscape painter Tobias Verhaecht. Van Haecht was born in Antwerp, and studied under Peter Paul Rubens. He worked in Paris from 1615 to 1619, and then travelled to Italy for about seven years. Van Haecht became a master in Antwerp's guild of St. Luke in 1626 and from 1628 onwards was the curator of the art collection owned by Cornelis van der Geest. 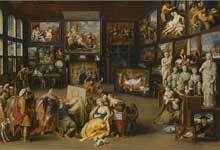 This collection is represented in allegorical terms in the Picture Gallery of Cornelis van der Geest (1628; Rubenshuis, Antwerp). The left side of the painting includes various portraits of contemporaneous figures, including (from the left) Infanta Isabel Clara of Spain, Archduke Albert of Austria, Peter Paul Rubens, Prince Władysław Vasa of Poland (who visited van der Geest's Gallery in 1624, with black hat) and the host showing a picture, as well as many famous paintings like Paracelsus by Quentin Matsys. Apelles Painting Campaspe (ca. 1630, Mauritshuis), another gallery painting by van Haecht, is significant because it may be regarded as "an ideal image comprised of elements drawn from Rubens's museum". Jeffrey M. Muller, Rubens: The Artist as Collector (Princeton UP, 1989), 41. Christine van Mulders. "Haecht, Willem van, II," Grove Art Online. Oxford University Press, [7 November 2007].